Paul Rouke takes a look at House of Fraser’s first e-commerce site and the lessons that can be drawn from its persuasion architecture, browsing functionality and overall user experience. Putting brands at what appears to be the forefront of their online strategy, the new House of Fraser website provides an almost immediate synergy between their online experience and the aspirations of the brand hungry visitor. On first view the site provides all the features and functionality you would expect from a site which has been developed using what I expect would have been a user centered design approach – high visibility of the search functionality and shopping basket (inc. summary of key info, a useful mini basket dropdown feature and the login/register links), clearly labeled and intuitive category navigation, a clear, best practice modeled checkout process and a strong focus on persuasion architecture. Overall, the new site navigation works well, with clearly defined categories, page titles and breadcrumb trails. Link language is very consistent which ensure users don’t need to continually learn what is and isn’t clickable. The common and essential (for large e-commerce sites) multi-faceted navigation introduced at sub-category pages (allowing users to filter the current products by price bracket, colours and brand) works well and ensures the brand focused users can shop by their favourite brands once they are looking at the product type that interests them. By providing a top level category specifically for brands, along with John Lewis, this again supports what I expect will be a large percentage of visitors objectives which will be to shop by brand – these shoppers aren’t just looking for a branded dress or pair of trousers, they want to see what range of products from their favourite famous brands are available, irrespective of product type. Whilst browsing the site during the course of this user experience review I discovered some slight navigational issues which may well impact on a users overall user experience. These are centered around some search results, consistency of link language and the destination of links, along with other small navigational in-consistencies. Overall these slight issues certainly don’t detract from the overall user experience, and House of Fraser may well be in the process of ironing them out following launch. The visual, flash driven main promotion, used to promote the current latest offers or trends, on the one hand provides an area of stimulation and intrigue for the visitor, but is also allows House of Fraser to expose key product ranges and individual products from their wide range. Following through on the brand focus, in comparison to competitor retail sites such as John Lewis, House of Fraser has chosen to introduce products through a featured brands section, rather than showing branded products from different categories. On the one hand this limits the variety of product ranges that are being promoted at this level, but it does allow this page to again target the brand hungry shoppers, in turn ticking the persuasion architecture boxes. It is at the top level category page that significant real estate begins to be used to show you previously viewed products. This user focused facility, not often adopted on competitor websites but one of the many integral areas of personalisation adopted by Amazon, is a great way of allowing a user to quickly revisit a product they have looked at earlier and what they liked. Although not providing a radically different layout to the product page compared to competitors (and therefore remaining consistent with best practice for product pages), House of Fraser has adopted quite an image-led user interface, where as you zoom into the image it fills the full width of the product page. With the clever use of transparent backgrounds this doesn’t detract the user from the key functionality on the page (price, title, description, quantity and add to basket), instead it serves to provide a richer experience whilst ensuring the product page acts as a persuasive experience focused on getting an emotional response from the visitor, such as seeing the high quality of the expensive product, therefore justifying the potential expenditure being undertaken. Visitors being made aware of what credit cards and payment options are available, using an unobtrusive link and a Ajax pop-up (an approach adopted on product pages). Another large checkout button at the bottom of the basket, especially for visitors who have large baskets and scan through them before proceeding to checkout. The standard delivery charge of £4 be applied to the basket, with a related message informing users that they can specify a different delivery option within the checkout process. A link to explain about promo codes – where to find them, what do they look like – this again would be an Ajax pop-up. In addition to showing recently viewed products, I would consider an area to cross sell and up-sell with a focus on brand names, as used throughout the site. For new visitors, providing the key benefits why you should register, thus encouraging users rather than making them seek out the benefits of registering through the help section. Once past the login/register page, the removal of all un-necessary links and functionality (navigation, search facility, mini basket, comprehensive footer) which can distract users and increase checkout process abandonments. Providing a clear, industry standard security message to offer re-assurance for visitors wary of shopping online. A clear process indicator is provided – where I am, how many are stages left – so the user feels comfortable and in control. Irrespective of the possible user experience improvements that could be introduced, House of Fraser has produced an excellent e-commerce website which perfectly suits its target audience and compliments its high street presence. 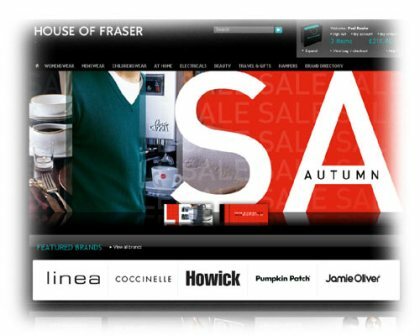 With a degree of richer user experience functionality introduced, and a clear focus on branding and imagery, whilst adopting very much a user centered design approach and significant persuasion architecture techniques, House of Fraser’s first transactional web presence is destined to be a great success and very much a destination website for style and brand driven online shoppers. A new survey from Deloitte & Touche has provided more evidence of the influence of user-generated reviews on consumers, as well as their growing significance for brands and etailers. The study focused on US shoppers, and found that of the 62% of respondents that read user reviews, more than 80% had been ‘directly influenced’ by them – i.e. the reviews had either confirmed their initial choice or changed their mind. Air passengers are turning in increasing numbers to web check-in and other DIY services as airports get more crowded and annoying, according to research from travel tech group SITA. Over half of the airlines it surveyed – including all low-cost and top 25 carriers – already offered customers the opportunity to check-in via the net, while 89% expected to do so within two years. Yesterday’s papers were full of talk about plans by Tesco to grow its online empire and cause even larger headaches for online retailers in the UK. Both the Observer and Mail on Sunday report that the supermarket giant is set to announce its long-anticipated move into the online clothing sector – one it has been planning since last year.